May B,. 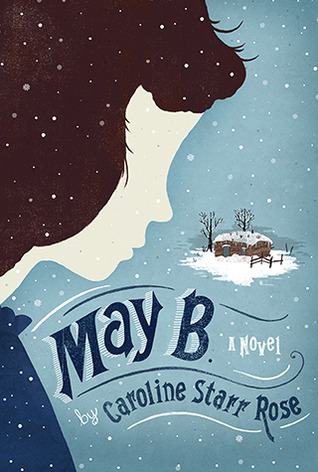 by Caroline Starr Rose, transports readers to the desolate, Kansas prairie in the pioneer times. It is written in brief verse passages from the perspective of May, a thirteen year old girl who loves school and longs to learn but is debilitated from achieving her goals due to dyslexia. Even with her hard work, it’s too expensive to keep her on the homestead, so her father strikes a deal with a couple living in an even more remote part of the prairie. She will cook, clean and do what they need her to do around their home in exchange for her room board and a small amount of money due the family when her Dad comes to pick her up before Christmas. after the sun has reached its peak. May is horrified about the prospect of her new life but is surprised to see just how confident and knowledgeable she is compared to the new bride for whom she is working. The Mrs. Is barely older than May and doesn’t love her husband or her life in Kansas. Through an unexpected turn of events, May is forced to survive; on her own for several months. Although she is scared and goes a bit crazy she does everything she can to survive a terribly harsh Kansas winter. The brief segments look like poetry and read like dialog which keeps the reader flipping pages at a clip. Rose paints surprisingly crisp characters and locations and the economy of her words is admirable. The book introduces issues from learning disabilities and bullying, woman’s role in families and society and simple survival instincts and the human drive to live. It’s a stunning simple and thought provoking work that can be used as a tool to teach kids from 4th grade through junior high school about the pioneer life and to show a successful example of an alternate writing style. Next ‘Cutie and the Boxer’ Scored a 95 on Rotten Tomatoes; Playing at the HCAF This Week!